Hello to everyone I’am Maurizio Biolcati, I’m 50 years, I love fishing 360 degrees, but my passion is ledgering, I met by chance at the age of twenty years, and it was love at first sight. Technique basically simple, affordable but very effective (perhaps too) allows an immediate feeling with this fishery, providing immediate catch even to those who practice this technique for the first time, especially if directed to barbel fishing. 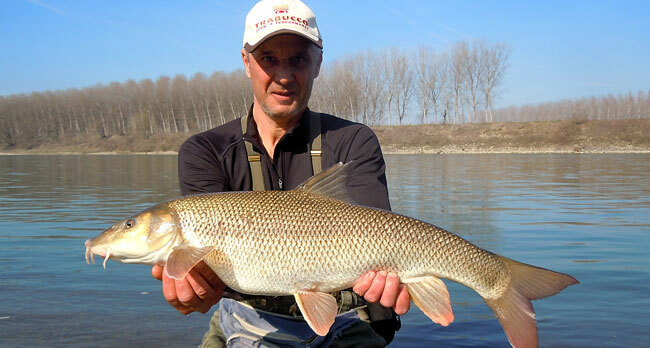 But ledgering is not only this, this wonderful and various technique, if implemented with the right criteria, and appropriate equipment, can undermine any fish in any type of water from savetta to carp. Allows the use of terminal capillary, small hooks and weights even lower than the ten grams with fishing rods that do not reach three meters, reaching its peak with more than four meters fishing rods which allow to cast weights from one hundred and eighty grams. Another aspect of ledgering are the specialist rods (their average length is 12 with various poundage), rods in two sections with avon tip. These rods are directed to catch big fish all kind of water, in “method” technique, using special bait, then trying to select the type and size of the fish. Currently I am President of the First National Association of Italian fishing LedgeringLBFItalia, President of LBFAdda (satellite company of LBFItalia) and columnist regarding ledgering on the magazine “Il Pescatore”.